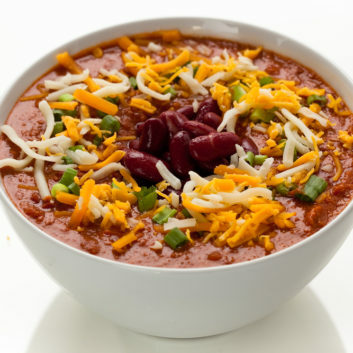 This hearty vegan chili gets a powerful punch of protein and fiber from the beans, making it a tasty and satisfying meal. I like to fire up the flavor a bit with diced jalapenos, but feel free to adjust the heat to your liking. Note: Rinsing canned beans in a colander under cold water can reduce sodium by as much as 40 percent. Coat a large pot with oil and warm over medium-high heat. Add onion and cook for 5 minutes, stirring occasionally. Toss in jalapeños, if desired, and cook 2 minutes. Add peppers and carrots and cook 5 minutes. Add diced tomatoes, beans, spices, and water. Stir and cover. Simmer for 5 minutes, covered. Uncover and cook for an additional 15 minutes, stirring occasionally. (The longer you let it simmer, the thicker it gets and the more the flavors come together.) Season with pepper and optional salt to taste. Feel free to top with a dollop of plain nonfat Greek yogurt, a sprinkle of reduced-fat shredded cheddar and/or chopped green onions. Note: Sodium information based on low-sodium canned beans. If using regular canned beans, be sure to rinse thoroughly in a colander under cold water to remove as much sodium as possible.